December 31, 2016-Happy New Year's Eve! We woke up with a bit of excitement this morning-Keaton and Graham were feeling a bit under the weather but by the time we all slept another hour, they were running around the house chasing their brother and begging for food. We were still able to sleep late but did eventually get up to get fold a few load of laundry-will it never end? The kids had gotten their own breakfasts so we didn't make the breakfast burritos like we had planned. Instead we started thinking about our lunch-Robby had been thinking about going to eat at Dennys for a few days now and it was definitely a memorable experience. It was a bit after noon when we walked in and were shown our table and no one spoke to us for 30 minutes. The kids were patient and I had just given the speech that we were indeed going to get up and leave when the waitress did finally come. Bless, she was just overworked but boo on their management. Reagan was the one who was going to be the most disappointed about having to leave but Campbell was going to be the one who was about to start crying. Robby let the kids all have their own meals and even milkshakes. What a way to end the year! The food was good-my favorite was Whitman's chocolate chip pancakes and it just made me think that we need to make pancakes more often around here-especially since Robby is so good at pancake making. After we ate, we dropped the kids off at Grannymom's house for a bit while Robby and I ran to Home Depot and Walmart. We bought stuff for our evening project and for some food for the Wilson's house. Once we came home, we started immediately on the boys' attic. We now have their nerf guns hung neatly on pegboard. It looked really nice and did get rid of a whole bin of guns from their closet. We stayed busy until almost 7 and then scrambled around to leave the house. Tonight we rang in the New Year at the Wilson's house.....we had enough food for several families but it was just us! We had pizza, chili dogs, chicken wings, cheese dip, cheesecake, root beer floats plus a few things I'm probably forgetting since its late. We finished the last game in time to clean up the kitchen before we rang in the new year with blow horns, poppers and a few pictures! Robby went in to work this morning so there was not as much lollygagging around-kind of sad. My boys were up early but this morning no one would get Whitman's breakfast for him. He would run back to me and say "they don't understand me." Now, I am not sure if the boys didn't understand him or if they just said that didn't so they didn't have to help him. Though he breakfast order was a bit complicated since he wanted one poptart, cereal, raisins and milk. Soon we were all up and did a bit of straightening before the Heltz came over for the day. They arrived around 10 and immediately everyone headed off to play. I had brought all of our big legos downstairs and it was wonderful. Michael and Whitman played with those legos all morning long. Keaton and Charlotte played with them some too. It kept them busy and in eye sight which was my plan. Around 12, we all loaded up and left for McDonalds. Robby was there and I am sure that we drew a few stares walking in with 10 kids. I did tell the kids that if anyone asked to just say that they were all brothers and sisters. I believe that they all ate about 3 hamburgers and 50 nuggets. Everyone enjoyed playing and it was nice to have so many watchful eyes: Robby bought half of our meal first and then I went to buy the rest (we had coupons.) I had told the kids as I walked out to watch Micheal and as I was waiting on my order, I saw him heading for the door out of the playground area. Right behind him was Graham, Anderson, Alyssa Kate, Campbell and at least one other of my helpers. Robby was also right there so that little guy had no chance of escaping! We ate and played plenty and then headed back home. Once at home, Micheal took a nap, Whitman needed one, Keaton probably could have taken one and Charlotte barely went outside since shew as probably tired too. The kids watched a movie and then headed outside for a bit of playtime. It was chilly outside so I didn't go out. The boys flew their drones and I think that I saw Reagan and Alyssa Kate getting a turn to. Last night, I forgot to write that when the boys flew their drones the last time, they showed off their skills. I was in the bonus room and opened the window and in flew Anderson's drone. Graham's drone was close but it didn't quite make it in the window! You know that you are a boy mom when drones flying in your house don't really phase you at all! When the Heltz left, the kids watched another movie while Robby and I cleaned out the fridge. We ate leftovers and then all sat down to watch a baking show while eating cookies before going to bed. We did a bit better waking up this morning though next week will still be crazy hard for us! Graham had already been in our room when we heard him and Anderson helping Whitman get his breakfast. Whitman apparently didn't trust his brothers that it was fine to eat his breakfast. He cracked open our door and asked "can I have pop tart?" Then he left and came back again to ask if he could also have milk. We then all did 30 minutes of school and that went so incredible smooth-not! My people had forgotten where there desk were, how to do their math, how to act and countless other things. It didn't help that I have a new sheet for Reagan, Anderson and Graham to complete each day to help with more accountability in their school work. We will probably do a bit of work like this early tomorrow or Monday. After we finished all of this, we did a few chores and then it was free time. The kids played for a bit while Campbell packed to spend the night at Nonna and Pops' house. Soon Nonna picked her up and they ended up playing games at Chuck E Cheese and even going out to eat tonight. We then had a late lunch and then the boys headed out to fly their drones (Robby enjoys this as much as the boys do but they are a bit stingy with how many turns that he gets-I think he wants one for Father's Day.) The rest of the afternoon was spent doing really nothing-playing games, playdohing, working legos, watching tv and helping around the house. I made Chinese for supper and we all ate during half time of the ballgame. It wasn't that great but it did kill hunger. By the end of the ballgame all of the kids (except Reagan who was watching tv downstairs) were upstairs in the bonus room with us playing with toys and semi watching the ending of the bowl game. Our days of being lazy are coming to an end and that makes me pretty sad but we did do this day right-in bed until mid-morning, briefly picked up the house, errands, lunch with one set of grandparents, more errands, snack at the other set of grandparents, leftovers, games and tv and then bed. Short blog tonight! Kidding, I guess I can write a bit more than that. We did sleep in pretty late this morning and again it was wonderful. We really tried to go back to sleep but just couldn't-probably because people were in and out of our bedroom the entire time. Before we left, we did do a few chores but some how didn't manage to get that laundry folded and put away. Seriously though, when I look at our laundry I am pretty sure that we must have more than 6 kids living at this house. Robby had ordered me an apple cider from Starbucks so I picked that up and then I ran into the library before we picked up pizzas for lunch. We ate at Grannymom's house and Lilly, Cash and Dana over to eat with us. The boys all ended up outside flying their drones while the girls played some volleyball. After a bit of playtime, it was back in the car. I jumped out at Walmart to do a return and then we were on to Kroger. By this time, Whitman was sound asleep. I carried him some in the store but eventually gave out. So we took Graham's sweatshirt off of him and laid Whitman down on it inside of the buggy. He slept the entire time there. Even though the buggy was full of Whitman, we still managed to buy quite a few good deals leftover from Christmas. We even bought a Christmas puzzle for next year-I can not wait! Robby did make me check out in a separate line since most of our sale items didn't scan with the correct price in the store. We then ran to Nonna and Pops' house for a few minutes and I made some cookies for us to have as a snack-along with the Sonic drinks that we had just bought. The kids watched a tv show about Big Foot and I think they really think that there is one. Once at home, the kids watched some tv while we worked on heating up leftovers for super. Then we played a round or two of Hi Ho Cherrio along with Pie in the Face game. Keaton and Whitman would not play for anything when their was whip cream ready to splat their face. However, when we just used a wet sponge they were all over it and thought it was hysterical. Kids are still watching their last movie tonight and then we plan on sending them all to bed soon! Our mission this morning was to stay in bed as long as we could. We managed to stay pretty long-even though we had to get up to get people breakfast, keep the laundry moving, go to the bathroom and countless other things. I did even sew up the Christmas stockings while laying in bed this morning-it was a pretty perfect morning...until I noticed that most of the floor of my room was filled with laundry. I am not quite sure how we did manage to stay in bed as long as we did because we could hear the kids building in the living room. I made jenga blocks for them and they have been used for everything except jenga. That was perfectly fine with me since no one really ever seemed to care too much for blocks-I guess they are just catching up. It does seem to be much more fun since they are giant. They have made chairs, tunnels, towers, obstacle courses, balance beams and even used them to make blueprints for a house. Whatever they were making, 54 blocks crashing and banging around could keep anyone awake. The boys watched movies this morning-Brain Games. Whitman will watch it as long as we let him right now. Robby and I wondered if he understood what the show was about-he is smart, but is he that smart? The girls eventually started coming down stairs (it was 11 when Reagan finally made an appearance.) They were quick to want to go outside and soon everyone was out riding bikes and flying drones. The neighbors were over too for a bit but when they had to go in, everyone headed inside. Eventually, Robby, Anderson and Campbell headed out to run some errands. Anderson had quite a bit of money from Christmas, birthday returns and a Christmas return. He chose a pretty large star wars lego to buy and was absolutely thrilled that they were able to pick it up today...we told him that he couldn't build it all today or we wouldn't have seen him for the rest of the day. They also bought some groceries, supper and sonic drinks for everyone. The shoppers hadn't been home too long when everyone went back outside to play for a while. The kids were outside until it was supper time. Grannymom and Grandpa came over for supper and after the kids had showered, we fixed our plates. We had BBQ for supper and ooey gooey for dessert. When we had finished the kids went upstairs to play with their toys-the girls played shopkins, Graham and Grannymom played blackjack, Anderson built some on his lego and Whitman tried to play with Anderson's knex roller coaster. Later in the evening Whitman, Campbell and I played Hi Ho Cherrio and the boys eventually flew their drones in the mudroom-now if that isn't an accident waiting to happen! We let the kids stay up a bit later than planned but soon they will head on to bed...right now though, the big kids are playing happily and the little ones are building with the blocks contently. The day after Christmas and we just did exactly what you should do on the day after Christmas-slept, shopped and played with our presents. Now the girls were up when Robby and I went to bed last night which was already this morning and my two little girls paid for it today. They were tired and cranky this morning but at least waking up with Lilly here too helped their attitude some. All of the girls were getting ready at 10 when I went upstairs to finally wake them up. The boys did sleep in this morning but as soon as Whitman was awake he knew what he wanted to do. Last night when I put him to bed, he did not want to go to bed without the others who were watching a movie. So to help we talked about what he was going to do when he woke up-he said he wanted to eat a pop tart and watch a movie. As soon as he was awake, I helped him get a movie (Anderson had already gotten his poptart) and he laid in the floor surrounded by blankets, pillows and new toys. Around 11, we loaded up to take Lilly home. Then we dropped a book off at Grannymom and Grandpa's house and ended up picking them up for our shopping trip. As we pulled into Target, we saw Nonna and Pops. My kids enjoyed shopping with all of their grandparents there and then again at Walmart. We looked at Christmas stuff, toys, clothes and pretty much everything else at Target and Walmart. Oh and we were big spenders (not really)-Keaton got a pair of leggings, Reagan bought two shirts and a pair of tennis shoes, Campbell spent some Christmas money on a sleeping bag, Graham and Anderson both ended up with shoes by the time that we made it home. Oh and our big Christmas purchases were two packages of goodie bags to use next year. After finishing shopping we dropped of Grannymom and Grandpa and then drove to Nonna and Pops' house to help them eat up their leftovers. We ate there and still didn't make a dent in Nonna's left over food. Then we went to Bass Pro in hopes of finding me another shirt but it didn't happen. Once we came back home, the kids went upstairs to the bonus room. I told everyone that they had to open or put up one present. Then everyone started their showers. While Anderson was waiting on his, he finished his knex roller coaster. He was pretty pleased with it and it was indeed neat. Both boys spent a lot of time flying their drones-they are getting to be pretty good with them-can turn flips and navigate through the house. The girls played with their shopkins and Keaton and Reagan played with Keaton's little dollhouse. Whitman and Keaton both spent some time building with the ginormous jenga blocks. We ended the evening with popcorn and coke while watching the old movie Turner and Hooch which I snoozed through most of it. Then it was bedtime for my crew. Our alarm went off at 6:30 and we could already hear lots of excitement upstairs. The girls had been awake when we finally decided to get our presents ready last night. I hope that they did sleep some last night since they were already wide awake this morning. We were pretty convinced that Whitman would be awake too since the boys were talking and laughing in their room but he was still sound asleep when I came in his room. We had told the kids that it would be 7:00 before we came upstairs to get them but it was around 6:45. The girls had already been combing their hair and changing their earrings and the boys were already wide awake. Poor Whitman was sleeping soundly but there is no snoozing on Christmas morning at the Dennie house. Robby videoed the kids coming down the steps and seeing the living room absolutely full of presents. Santa gives each kid a present, we give each one a present and then they draw names. This year most everyone bought each other a little present from the dollar store so that greatly added to the present piles. When they made it down the stairs, everyone found their spots and dumped their stockings on the floor. The stockings were completely loaded down-every year Santa seems to forget how small our stockings actually are. I am actually going to have to sew a few of them up before I put them back in the attic. Here is the present rundown-Reagan received a bike (white and blue-not pink or purple), movie gift cards and a toy turtle that swims from Campbell. Anderson opened a huge lego box (I don't remember the name but he sure will tell you all about it. ), a drone and more legos from Keaton. Graham was thrilled with his new bike, drone and his legos from Anderson. Campbell got a paint set, doll bed and even a shopkins doll from Whitman. Keaton received bike accessories, doll house and a big bouncy ball from Reagan. Whitman finally got his trex from Santa, a bike and Spiderman and little trucks from Graham. The kids took turns opening their presents but somehow Robby and I didn't even open a present until they had all finished. Our stockings are a little bit bigger than the kids and they were completely filled too. Robby received a camera chip, jumper cables, tennis shoes and a pull over. I opened a snowman bag, a crockpot and a dutch oven. As soon as we had opened everything, Robby and I ran to the kitchen to start on breakfast-monkey bread and breakfast burritos. Everything was just about ready when the grands and Jason all showed up. The kids had made notecards to give to Nonna and Grannymom for them to use throughout the year along with quite a few Christmas cards. We all ate and then we ended up outside-Reagan and Graham could not wait to ride their bikes. Whitman could really care less about his bike but he did sit on it for a few pictures. Campbell needed her doll carrier from Grannymom installed on her bike and Keaton put her bike accessories on her bike. It was like we were a bike workshop but soon everyone was riding in the wet misty weather. When the grands left, we worked on straightening the house. The kids helped move presents upstairs to their present piles in the bonus room. Two nights of presents plus this morning makes quite big piles. Campbell and Anderson even have stuff in their pile from their birthdays. The house was pretty much picked up by the time that we jumped in the car to head to Dana's house for Christmas lunch. Dana had 3 types of lasagna and salad for lunch. It was a pretty great lunch and pretty relaxing. The kids and Robby eventually headed outside for some drone flying lessons from Cash. I heard that the boys did pretty well but I also heard that Robby almost flew one into a creek and on to the roof of two different houses. We came home around 3 and Lilly and Cash came with us. This kept the kids occupied and we decided to take down the Christmas tree. The kids were busy building with the giant jenga that I had made for them, melting crayons into rings and building legos. Cash went home around 6 but Robby and I continued to work while the kids played until 8. I am not really sure why it took us 5 hours to put everything up-well, we did have a hot water tank problem in the middle of our work. Last year I was bummed about taking the tree down on Christmas but this year, I am perfectly fine with it. The kids were occupied and we are now exhausted! I fed the kids and then we sent Whitman to bed before starting a movie for the others. They watched one movie while I fed them popcorn, m&ms and coke. Then we even let them start another movie before heading to bed tonight. Christmas Ornament Countdown 2016: Merry Christmas! This Christmas morning we close our 7th year of Christmas Ornament Countdowns with my favorite new ornament. On this year's road trip, our day in Boston was near the end. We had been expecting rain and we were not even sure if we were going to be able to see the city or not. We took a chance and drove right into the city. After parking right near the Cheers bar at Boston Common, we loaded the stroller up with snacks and headed out for a day. Click here to see the blog and pictures from that day. We walked through the park and took a few pictures by the duck statues and then headed towards the Swan Boats. We have never been on the boats before and that day they were about to open in a few minutes. The prices weren't too bad so we jumped in line for the short wait. The ride was short and so fun. The kids enjoyed floating near all of the ducks and I think that the Swan Boat ride should have been on my bucket list so I could have marked it off. When we finished the ride, I walked quickly through the little store area and my ornament caught my eye. Except that it wasn't an ornament, it was a craft kit. Robby saw me looking at it and came over with money in hand. I already had a few tubs full of ornaments but we always have room for one more (even if our tree is full). 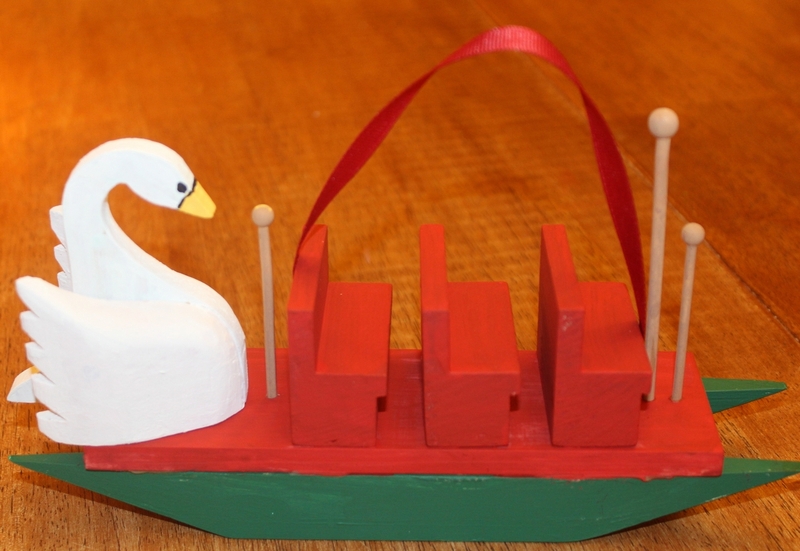 When we came home, the kids and I worked together to paint our Swan Boat ornament. Here are a few pictures of that experience. A few weeks later, we started listening to the book The Trumpet and the Swan. The little swan in the book goes to Boston and plays his trumpet as he leads around the Swan Boats. Each time I see this ornament, I smile thinking about the great memories we made on our road trip. I hope that you have enjoyed our little Christmas Ornament Countdown this year and I hope that you have a wonderful Christmas. I am almost embarrassed to say how long we all stayed in bed this morning but we all needed a little extra sleep. The boys, as always, were the first ones up-they had lego building on their mind. Then the others started moseying down the stairs. I told them to all get their own breakfast and they are getting pretty good at it. We didn't really have much to do this morning so it was a lazy morning. Robby, the procrastinator of the family, did have to run an errand or two. While he was gone, the rest of us did some laundry and straightened the house. After the house was clean, the kids all sat around the tv watching their current favorite tv show-Brain Games. It tickles me that Whitman enjoys that show as much as the others and I have to be careful when I am walking through the room or I will sit down and watch along with them. Once Robby came home, we headed to the bonus room and started working on the puzzle some. We worked and worked and worked some more. If we had a little bit more time then we could have finished today but I finally went downstairs to take my shower and was shocked to see that we only had 25 more minutes before we needed to leave. I quickly jumped in the shower while Robby urged the others to get dressed. Soon we were in the car heading to the church house. All the grands had already saved us spots so we filled their pew and Robby, Whitman, Jason and I sat behind them. During the service, Whitman sang along as we sang and could not contain his excitement for the candle lighting. All of the kids love holding the candles and since we didn't set fire to anything, I will call it a win. We all headed to Nonna's house and while she and Pops finished getting supper warm, we sat in the floor and made reindeer food. This was messy yet exciting and I had to sweet just as soon as we were finished. Nonna had the whole Christmas dinner spread and Graham loved the ham that she had cooked. When we had finished eating, we took the customary pictures in front of the Christmas tree and then the present opening commenced. Reagan was thrilled with her new jacket, Anderson's favorite was a big pillow, Graham just loved everything he opened, Campbell was pretty pleased with her new robe, Keaton was exciting about her pens and markers and Whitman enjoyed his pogo stick, along with all of the others. After we had opened everything, we started on dessert. After a bit, we did have to leave the party and head home. We had reindeer to feed before putting everyone in bed. Robby and I did a bit of wrapping, some cooking for in the morning and then sat down to watch the end of It's a Wonderful Life. After riding on the Strasburg railroad on this years big road trip, we needed something to do for the rest of the day. 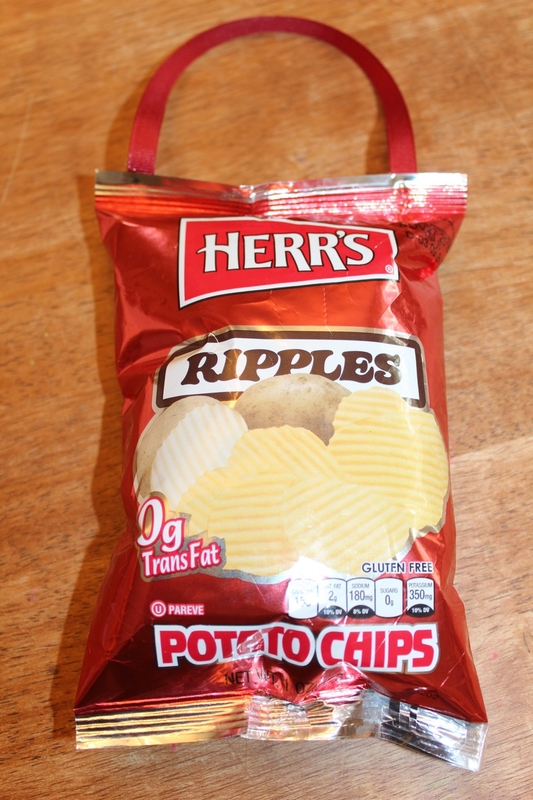 I had called 2 or 3 different places about a potato chip factory tour and hadn't really found any that had spots for us. It was a beautiful drive through the Amish countryside so we decided to drive on to the Herr's Snack Factory. We knew we couldn't have a tour but we also knew they had a gift shop and there was a park nearby. Robby sweet talked the lady into letting us watch the video about the Herr factory and then we shopped and shopped at the gift shop. Sometimes you do things on trips that are okay but then other times things are a lot of fun. That is just what this little stop was-a lot of fun. So much fun that as we were eating some of our sample of chips during our picnic, I decided to save one of the bags. A bag of potato chips is indeed probably my most unique Christmas ornament. It makes me laugh each time that I see it and makes me want to go back to Herr Snack Factory to take the real tour. Here is the blog and pictures from that fun day of our trip. Since we had let the kids stay up so late last night, we let them sleep as late as they wanted this morning. For my boys, that was still 7:00. What in the world? Who wakes up at the same time every day?-a weirdo, that's who! I am not sure when Whitman did wake up but I know around 8, Keaton burst into my room saying that Whitman was playing the guitar upstairs. She was in a panic and continued with "he is going to wake up that girl, whatever her name is." Poor Camryn was woken with a serenade from Whitman and my little girls could not get her name right all day long. The kids did grab breakfast-the boys headed back to the couch and the girls headed upstairs with their food and that is pretty much where they all stayed most of the day long. Robby and I were busy-wrapping, painting a kid gift, getting food ready for tonight, laundry, sweeping, straightening even working our Christmas puzzle. The kids eventually headed outside and played until they got hungry. They came in and ate and then were back outside until we called them in. Everyone took showers and then we loaded up for our Dennie Christmas. I took the girls and Whitman to drop off Camryn and then we headed to the restaurant we ate at the other night. Keaton had left her purse there and thankfully, Campbell and her remembered that she left it there. It was a Mexican restaurant and I told Keaton that we had to run in and then run out so our clothe wouldn't be smelly. Once we made it back to the car, Campbell told me that she had told Keaton to try not to think about her purse in case we weren't able to get it back. Thankfully, they had her purse and we were back in the car quickly without smelling like the Mexican restaurant. Robby and the boys grabbed some ice from Sonic and then arrived at Grannymom's house. By the time that we made it, everyone was already there. The house was full of people and the tree was loaded down with presents. Grannymom had little presents and we passed them around as she read Twas the Night Before Christmas. I ended up with a jar of skittles and Robby got a little picture frame. The kids all won different things-box of skittles, bottle of water, gum, box of oreos and the like. There was a table full of goodies and we all ate and ate on them. Then we opened presents-the kids all racked up. All of the kids opened lots of presents-they all received money from Les and Shelley. Reagan piled all of her stuff up in a box and just kept looking at it tonight, Anderson wore his head lamp most of the evening, Graham was thrilled about his bag and clay, Campbell just loved all of her stuff, Keaton wore her mermaid blanket to bed and Whitman enjoyed his magna doodle. Grannymom drew my name and I opened up a pan, checkers,stuff for my cricut, tape for my label maker and my favorite gift-a gift certificate for babysitting! Grandpa had Robby name and he got a rain gauge/thermometer and ice for his yeti. After we all opened presents, we ate again-soup and sandwiches. Then the kids started playing with all of their loot. The girls worked on making their pillows, Whitman played cars, I beat all of the boys on checkers. Eventually it was time to leave-my Whitman cried most of the way home since he didn't want the Christmas fun to end. Once home, we all unloaded and the kids laid out their loot before we finally put them in bed. Robby and I visited Mount Vernon BK (before kids) which was quite a long time ago. I had been wanting to go back and visit but our last few trips to D.C. didn't leave us any time for side trips. During this years road trip, Robby ended up moving our departure time up a day or two so we would have time to make a Mount Vernon stop this year. Here are the pictures and blog from that day. It was hot on our tour through George's house but it was still really great. Last time we weren't able to tour the house but this time we were. They had an online quiz and the kids had a big puzzle page to fill out as they learned about the property. Obviously, he gave me the okay for it and I think my Mount Vernon is a pretty nice little ornament and fits in nicely on our tree! The kids grabbed breakfast and ate in the car in the while we drove to the children's library. We knew the crowd was going to be crazy and indeed it was. We were given tickets of the next showing of Craig O'Neil reading How the Grinch Stole Christmas. That was fine, we had a few errands to run before returning. Back at the library, we were packed in the auditorium like sardines but it was still good. The kids enjoyed listening to the Grinch. Whitman was wide eyed the entire time. Then we headed downstairs to get green ice cream (which they were out of-we had some for lunch though). They were passing out free books to the kids-my Graham found the book about the governor's mansion that the grandmas have been reading and was so excited to pick it out for his book. We then took our picture with Craig and headed on back to the house. At home, the kids had their lunch and ice cream and then they started on chores. When the house was almost in order, I just up and left Robby with everything else to do. Not really, I had a dentist appointment (no cavities for me). He spent most of the afternoon cleaning our filthy kitchen floor. Except we couldn't find Whitman. He had been outside just moments earlier with all of the kids in our yard. The others had just ridden down with the neighbors to take them home so I knew he wasn't down there. He wasn't in the garage and I had just come from inside and he wasn't inside. It was getting dark and panic quickly set in. I had already walked back through the house calling his name twice. I do have on a bright yellow shirt and all of the kids could then easily see me running around the house and they took off riding in different directions in the yard hollering his name. Keaton was just standing on the driveway looking terrified when Campbell called from inside that she found him. We then had to yell to the rest of my lookers that he was found. Whitman had gone inside to go to the bathroom (in Robby's closet) and had closed the office door. A few minutes later, when Graham was getting in the shower he looked at Whitman and said "you scared me to death, Buddy." I agreed and told him that I will live a few less years because of that incident. Just as soon as everyone had showered and dressed again, the Penningtons and McGuires all showed up for our Thursday night Christmas party. We had our leftover chocolate candy from the other night plus a few cookies along with sausage balls, cheese dip and toasted ravioli. Everyone else brought just as much stuff and we had ourselves a smorgasbord of goodies to eat. We ate and were able to talk tonight since the kids all were pretty subdued. The kids did enjoy playing a game of Bingo-Robby had bought prizes for everyone to win and they had a blast. Everyone stayed for a while and when they left, Camryn was able to stay. We let the kids stay up while we cleaned and then we sat down for a bit and still let them stay up. It is after 11:30 now and we are just sending them on to bed! The holidays have begun! On this morning, we had a long drive ahead of us so we were up and leaving early. We did brave a bit of the leftover tropical storm in Newport, picked up a pizza in New Haven and then drove on to our way to New York. 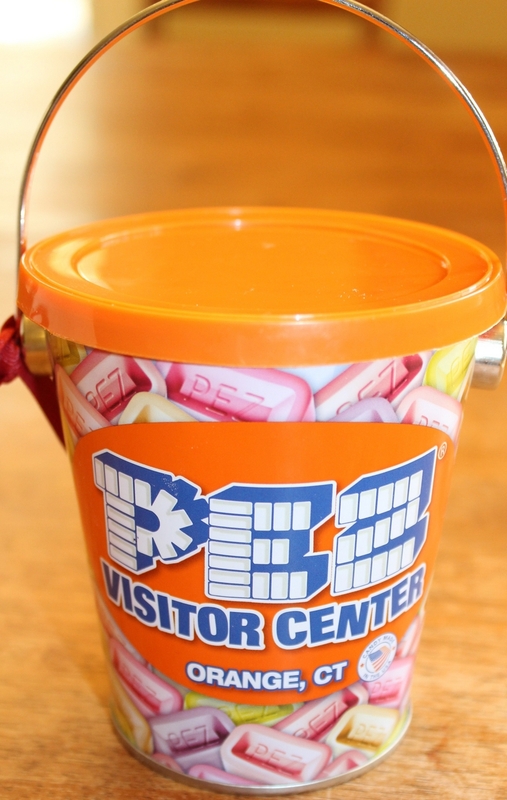 We really needed something exciting to do on this driving day and had seen pictures from the Pez factory in Orange, Connecticut so we stopped there. If you look at the blog and pictures from that day (click here), you will see that the factory tour was just a glorified gift shop. That didn't matter though because we didn't have long but we were on a mission to find all of the Pez dispensers on our bingo cards so we could all get a free Pez dispenser. With each admission, we were able to pick out a dispenser for free and then we all earned ours from the bingo card. 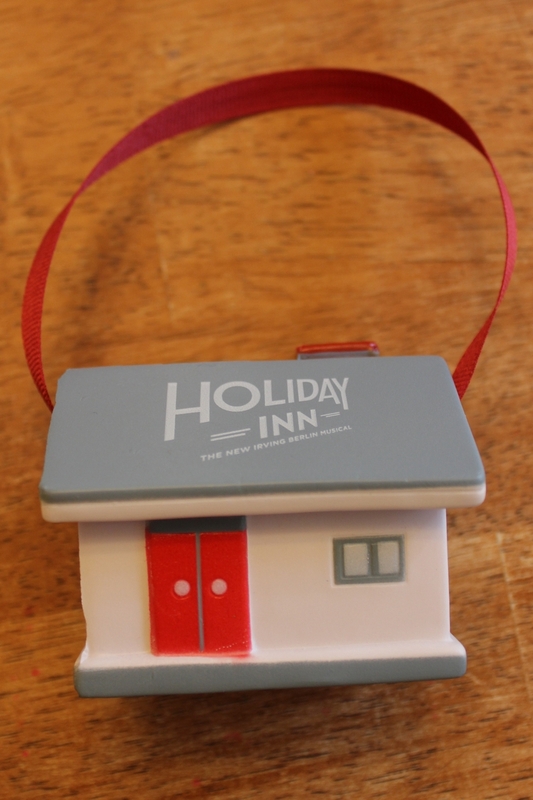 We left that place with at least 16 Pez dispensers and Robby decided that we needed a few refill for all of our new Pez dispensers and they came in a handy Christmas ornament or maybe it was just supposed to be a can! The holidays seem to be flying by and I can't believe that there are only 3 sleeps until Christmas left. That kind of makes me a bit sad that the holidays are a bit over but honestly, I am pretty ready to get my tree down this year. Robby just mentioned that it looks like someone has fallen into it and it truly does: ornaments are crooked, the top is leaning, the monorail is rarely on the track. None of that mattered this morning though because we had a birthday to celebrate. Robby had cinnamon rolls ready and as soon as everyone was awake we sang Happy Birthday to Campbell. Can't believe that baby is 7 years old. It is after 10 and she is just now actually turning 7-if you remember, the held me off from having her until my doctor returned from his Christmas party. She blew out her candles and then soon we started on our history and science. As soon as we had finished that, we did some speed chores since we had places to be this morning. The kids were heading to Grannymom's house while I ran a few errands to finish up some Christmas shopping. The kids played outside some-a game of kickball and a bit of 4 square before coming in. They were all sitting in the house quietly when I came back. After Robby ran a few more errands on his way home from work, I believe that we are now completely ready for Christmas except for those daily trips to the grocery store that we will probably take over the next few days. We came home around 2 and the kids watched movies until someone saw the neighbors outside. They were soon out of the house and only returned at 3-the exact time that I had told them they could have a snack. I sent them outside with their gingerbread houses and then I cuddled up with Whitman for a bit. When Robby came home, we loaded up to take Reagan to Grace's house. A bunch of girls were there and they spent the evening caroling around the neighborhood, drinking hot chocolate and eating cookies. We spent the evening celebrating Campbell's birthday again with candles in her nachos at Ta Mollys. She was not happy to see the lettuce on her plate and made sure that Robby knew that she wasn't going to eat the lettuce. We had some time to run into the store for Campbell to pick out some cupcakes and ice cream to celebrate one last time once we made it home. Then we did drive around a bit looking at Christmas lights before picking up Reagan from her party. When we made it home, we sang to Campbell as Reagan played the piano. Then shower time for everyone followed by our Christmas countdown and then it was bedtme for my crew. Tomorrow looks like it will be a big day too! 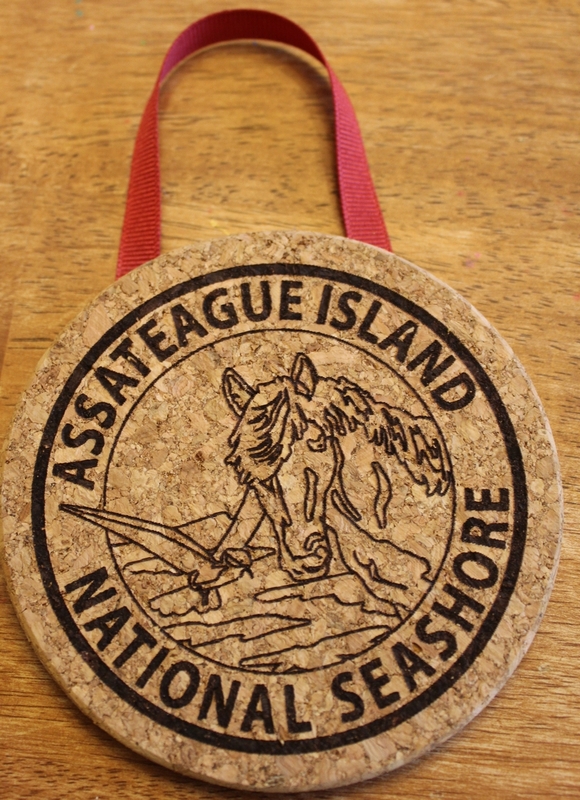 Our first visit to Assateague Island National Seashore was in 2010. It was a great spot and I have a picture in my room of Reagan, Anderson and little Graham in front of some wild horses. We returned to the other side of the site in 2011 and were viciously attacked by mosquitoes. However, on our road trip this year there were no mosquitoes and our stop there was pretty perfect. We were a little concerned about not seeing any horses so we turned around once so we could see the ones that were in the parking lot. Of course after we did this, we did see quite a few horses everywhere. The kids enjoyed our stop there with our picnic in the sand and then our short little walk in the beach. Here is the blog and pictures from that day. When my alarm went off this morning, I didn't stick around in the bed too long-the heat was blaring right on me. I ended up walking down the hall and went upstairs to check on the girls. I had been pretty convinced last night that my little girls were going to wake up with the stomach bug in the middle of the night (they didn't - thank the Lord) but I did head up there to see if they were sleeping still. The big boys and Campbell were already playing their ipads in the living room but I heard someone awake upstairs. It was Whitman who was crawling around in his room like a dog. He asked me to make a train track so we made a pretty big track. I then headed back downstairs and turned off the heat before climbing back into bed for a few minutes-it was a good thing that I did because soon Keaton, Campbell and Whitman were all in the bed with us. Robby cut the boys hair this morning before he headed off to work. After their showers, we started on a tiny bit of school work. Then it was chore time. When the kids had finished chores, I told them that it was time to clean out their desks. They headed off to work on that while I went to Graham's desk to help him with his. He was quickly finished since he doesn't have too much in his drawers. Then I walked to the school room and every piece of paper and every pencil was pulled out of all 4 desks and were on the floor. It was chaos-I did ask them to do this but my, oh my. It took a good 45 minutes but their desks will be so nice for the next week or two. Of course, our trash can was already overflowing outside so probably generating a complete trash bag full of new trash a few days before Christmas was probably not the best idea. We had our lunch and I read a few Christmas books while the kids ate. Then we had a short little afternoon-the kids managed to squeeze in playing outside, wrapping presents, making a few cards and even watching a movie or two. Then it was off to deliver Ms. Stacy's Christmas present that I forgot to take to school the other day. 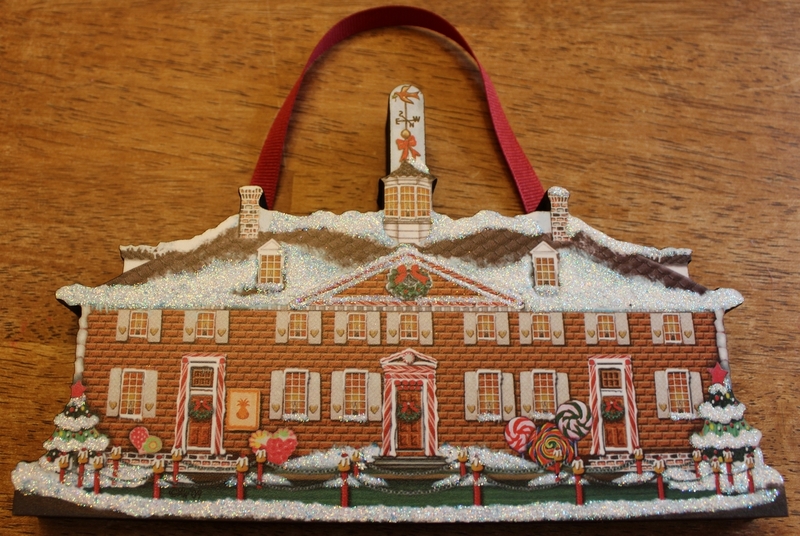 Then we headed to the Crafts house for a gingerbread house decorating extravaganza. They had everything all set up and the kids went to work. They had a blast. My Reagan was the most intense on hers and created a masterpiece. Anderson worked on his but when it fell down, he just started adding candy. He told me that he wanted his to look like a candy monster threw up on it and it did. Graham worked really, really hard on his and it looked great. Campbell was down a bit from me but she and Keaton loved decorating their houses. Whitman would just stand in front of his adding candy and when I had to step away to help the others, he would just stand in front of his saying that it was "so pretty." When the kids finished with their houses, they all headed outside to play and could have stayed out there a long, long time despite the cold weather. I finally broke up the party when I loaded up our houses and my people to head home for a few minutes. As soon as we made it home, we turned right back around and went out to see Christmas lights. Our first stop was the capitol building. The kids climbed the steps and then we walked inside to see the tree. Then it was onto the crazy house in North Little Rock. After seeing that house, Reagan had to use the restroom so Robby told the kids that we would drive to the prettiest house on the next street and stop there for the bathroom. We turned, saw a house with lights, pulled over and stopped the car. Robby told Reagan and Anderson (who also said that he needed to go) to go on to the door. Anderson was quick to say that he could wait and Reagan was not going to get out of the car for any reason. It was Patrick's house so everyone did climb out of the car for the bathroom. After the kids had all pottied, we jumped back in the car to drive by a few more NLR houses. Then it was back across the river to McDonalds to eat a quick bite of supper. The kids enjoyed climbing on the new play stuff and as soon as we had finished eating it was back in the car to see a few more lights. We drove around Chenal a bit and then headed home. We pulled in right at 10-Whitman was asleep and everyone else headed to the showers. They were soon all sound asleep within minutes-it was a big day. We dressed up and headed to see our show. We saw Holiday Inn and it was the cutest little play. The kids (and us) sat spell bound throughout the entire play. When we came home, we even had a family movie night and watched the movie. My people were pretty excited this morning but that didn't help the girls wake up any earlier. I had to eventually wake them and Whitman up around 8. We started first on breakfast and then moved on to our chores. The kids can work well when they have an exciting day planned for them and this was definitely an exciting day. Before 9, we had all eaten our breakfast and were working on picking up the house. Robby had barely made it out of the driveway, when our homeschool buddies started showing up. The Heltz, Kamps, Skinners, Stotts and Powells were all here today and it was a houseful. There were 2 extra kiddos so I think that kid count was 19. The first activity of the day was Bingo. We played 3 games since there were 3 prizes and then we moved on to making cards. The group made around 50 cards and I was pretty excited to put them in envelopes tonight because I know that there are going to be some pretty happy people when they check their mailboxes in the next few days. Then the group played some minute to win it games with Jodee. She had a game for everyone-pulling tissue paper out of the box, throwing snowballs on a plate, stacking marshmallows, picking up candy cane and stacking cups. The kids had a blast and could not contain their excitement-that is a polite way to say that it was crazy, crazy loud in this house. Next up was lunch and then we finally let the kids go outside and play. They had been going outside whenever they had a chance but we kept calling them in to do something. They all played for a bit and then it was finally time for the long awaited presents. This year we played dirty Santa with the kids and it was wild. At first no one stole presents but eventually that was all that they were doing. Most of the kids did really well when their presents were stolen from them-including Whitman. I think that everyone received something that they were happy with in the end so that was a good thing. Now the Moms had their own gift exchange and their gifts weren't a dollar but worth 20 dollars. I ended up with a neat Pioneer Woman mug which I was really pleased about. The kids had some more time to play and then everyone started heading home. By the time Heather had left, she had completely swept my kitchen and is my new favorite. Then the kids helped pick up-they again worked hard because we still had one more thing to do today. I had ice cream cones for the kids to decorate into Christmas trees but we didn't get around to it with the homeschool buddies. So once my crew was finished cleaning, they sat down and got to work on their ice cream cone trees. Everyone was pretty pleased with them and then most of my Dennies had them for a little snack. Before too long, Robby was home and we spent the rest of the evening just vegging out. The kids watched some tv, I wrapped some presents and we all did our nightly Christmas ritual of pulling Santa, finishing the What God Wants for Christmas box and even talking about Christmas ornaments. It was a pretty busy day and we are all exhausted! The National Baseball Hall of Fame had been on Robby's list for a long while and this was the trip that we finally made it. Cooperstown is in the middle of nowhere which made getting to it and leaving it pretty interesting. It was a beautiful drive in and out but seriously, it was in the middle of nowhere. We doubted the GPS the entire time but did finally make it. The town was really neat and I would love to go back to that area of the country and spend some more time. Here are the pictures from that day of our travels on this year's big road trip. We toured the National Baseball Hall of Fame and the kids really enjoyed it so we bought an ornament to help remember our trip. 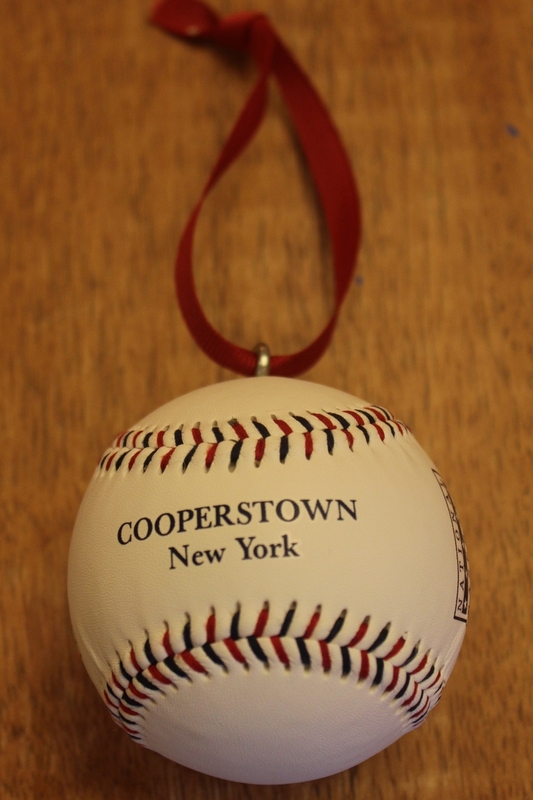 Now, I need to go and look at my tree and make sure that this baseball is hanging near the bat from Louisville Slugger. Some time in the middle of the night, Robby accidentally turned the heat off in the house. He isn't sure what happened but it was mighty cold in our house when we all woke up. When Whitman climbed into our bed, his little toes and hands were ice cold. Everyone soon forgot about being chilly when Robby started passing out doughnuts for breakfast. We all soon had on our clothes and were rushing out the door for church. When you climb in your car in the garage you really don't realize how cold it actually is until you climb out of the car. Brrr, it was cold this morning walking into the church house. We had a Christmas party in our Sunday school class-charades, bingo, cookie decorating. Then it was time for big church followed by lunch at Nonna's house. She had BBQ which the kids love and then it was time for Campbell to blow out another set of candles for her upcoming birthday. Back at home, I worked in the kitchen some while Robby went to the grocery store-yep, we were there Friday night and I was there last night but we just can't stay away from that place. Before too long it was time to load up for our first Christmas party of the season. Tonight we celebrated Christmas at Shannon's house with Laryn and Alicia and all of their people. We had tons and tons of food and ate and ate. We stayed out too late and my kids were pretty tired by the time that we came home. Blog is a bit short tonight because I was hurrying trying to write it quickly before Laryn went to bed so she could read it-though it is midnight so I probably didn't make it! We were fortunate on our big road trip this year to stay in New York City for 5 nights. We had plenty of time to just walk around and enjoy the city. I had been looking forward to see the High Line and it did not disappoint. It was an old elevated subway track that went a mile through the city. They had stopped using it and turned it into a city park. There were statues and benches along the walk. It was really neat and almost peaceful. 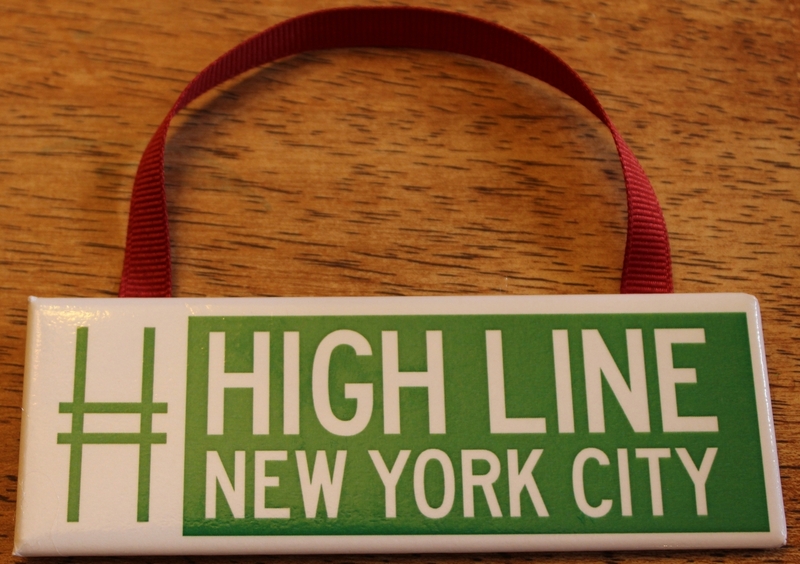 Since this was a new stop for us in New York City, I decided that we needed an ornament to remember it by. I would love to go back and walk the High Line again and stop at Chelsea Market for lunch next time (we accidentally walked past it last time.) Click here for pictures from that days blog and to see the pictures. Soon after we woke up this morning, Campbell, Whitman and I drove down the road to pick up a few doughnuts. When I gave the ladies my order, Campbell asked if we weren't getting any chocolate doughnuts. I hadn't ordered them this time but when Whitman piped in and said that he loved chocolate, I upped my order by one more dozen-this dozen was all chocolate. Grannymom and Grandpa were at the house this morning to help install a new microwave in the kitchen. It hangs above the stove and looks like it has been there forever. While they were here, I laminated a few things and the girls did some painting. Before we really knew it, it was time for Graham and Robby to head out to his ball game. I knew that I was pushing it with my time but still made sure that the house was a bit picked up before we left. I loaded my people and jumped in the car to start it...and it didn't start. Robby called Tony for me and he was there in a flash to jump my car. Now, I guess tonight I will get a car jumping lesson-I have had one or two lessons before but I am not sure that they took. We still made it to the game in plenty of time. Graham had a good game but lost by 2. He enjoyed himself and made a few shots and recovered quite a few rebounds. He was very excited that he made a buzzer beater shot. He later told me that he thought his dad didn't push the buzzer button until after he made the shot on purpose. I didn't even tell him that it was automatic. During the break between the games, we ran to Arbys to pick up a bit of lunch. Then it was back to the courts for the next game. The team that Anderson was playing had many players that weren't there. So they scrimmaged which wasn't quite as exciting as a real game but Anderson still had a lot of fun. He made a few shots today and even had himself a buzzer beater. When the game was over, Jason, Anderson and Graham headed off to see the new Star Wars movie. My boys were beyond excited about this and going to McDonalds on the way home helped them have a great evening. Back at the house, the kids played outside some and then I started working in the kitchen. Keaton and Whitman helped me make meringue kisses and Campbell helped me make a zillion pieces of chocolate candy. We continued working in the kitchen cooking for tomorrow and the Wilson's came over to watch. Shannon and Tony helped Robby with his sausage balls and Shannon and I even ended up at the grocery store for her shopping trip. The kids spent most of the evening eating what we were making and watching tv. They enjoyed their lazy night and no one complained when they went to bed after 9. It was another good day here at the Dennie house. 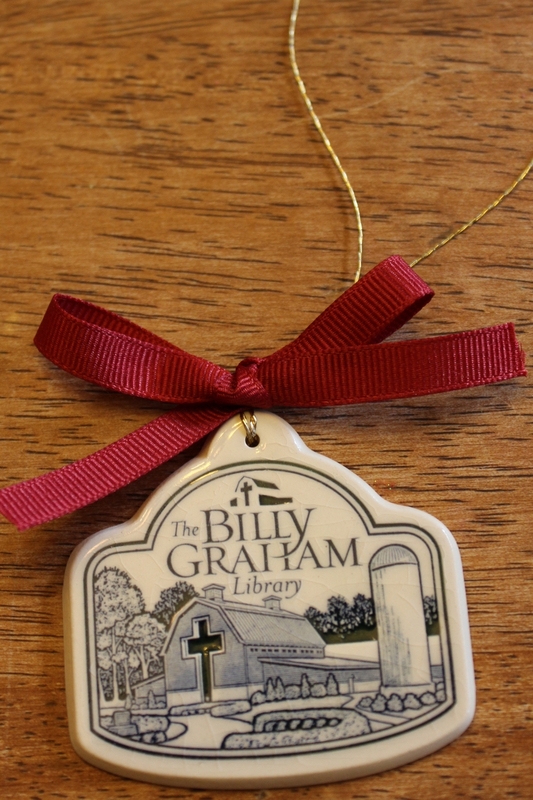 The Billy Graham library had been on our short list for a little bit. We have visited all of the presidential libraries and looked just as forward, if not more, to seeing Billy Graham's place. This stop was quite near the end of this year's road trip (day 24) but we were still going strong. Click here for the blog and pictures from that day. My Graham was the little Dennie that was the most excited about this stop. We didn't name Graham specifically after Billy Graham but we did like the name and we also liked the man so it was a keeper name (same with Reagan). The tour of the library was really, really neat and since they had a neat scavenger hunt for the kids, they stayed crazy interested in what was going on. (We highly recommend for you to put it on your list.) Since we enjoyed it so much, we knew that we had to have an ornament and this is the one we picked. Friday morning around here and I didn't have to worry about getting my littles off to school so it was a bit more relaxed. Whitman did join me in bed this morning and after laying with me for a little bit, he walked to the light switch. I didn't think that there was any way he could turn it on but sure enough he did and I was blinded by my lights. It is just amazing how quickly my people are growing. Not only can Whitman reach the light switch now but when Robby measured everyone the other day, Anderson and Campbell had grown inches in the past few months. Graham hadn't grown too much but Reagan has shot up lately. Soon I will have people taller than me. School was a bit louder than usual since Keaton and Whitman were with us today. Poor Keaton fussed about every single thing, every thing. I just sat and watched her for a bit at one point and wondered if she would make it here next year for kindergarten. I just have to assume that she doesn't really feel 100 percent and that is the reason for her fussing. After we worked together, I made everyone do chores and it did take us a bit longer than usual since the last chore was to sort the legos. It is just something that must be done occasionally. Graham started off well and finished well but still only worked 50 percent of the time. Anderson and Campbell, who I think both might have a touch of ADD, worked about 30 percent of the time. Keaton sorted for 75 percent of the time-even though it was still at a 5 year old level. But my Reagan, my rock, worked the entire time. Not only did I tell her how much I appreciated her, I also showed her where my cookie stash was. We then had lunch but before I could fix it, the kids saw the neighbors out and everyone but Whitman and Reagan went outside. I told them to come back inside in a few minutes so they could eat but they must have remembered that they had school work left because while they ate their lunch, the worked on their school work. Soon though everyone but Whitman, who had picked our shorts and a tshirt to wear today, were playing outside. I occasionally had to know on the window to tell people to put on socks or put on a jacket. I am not sure exactly what makes you wear a tshirt and shorts outside when it is in the 30s but I can understand why we all have colds. When the boys did come in, they quickly asked me for some hot chocolate. They had just migrated back outside when I called everyone home to head to Nonna and Pops' house. I volunteered them to keep everyone while we went to the grocery store. Since we were going to be out alone, we even went out to eat-possibly our first time to go out to eat by ourselves since Valentines. We picked Chilis and before 6 it was already crazy in there. We finally did get a table and ate-even though the food was good, we were reminded that eating out is just so overrated. Then we had to hurry through the grocery store but since most of my list was in the baking aisle, it didn't take that long. I swear I bought at least 20 bags of chocolate chip items. I probably should head right to the kitchen and start baking but I have to head to the garage after this blog is over to start sanding my Christmas project for the kids. The kids had supper at Nonna and Pops' house and most had showers. I believe that I had a few that were a bit contrary over there but not too badly, I hope. Once at home, the kids stayed up for a little bit and then it was bedtime for the crew. Next week is a busy, busy week and we all need a bit of extra rest! 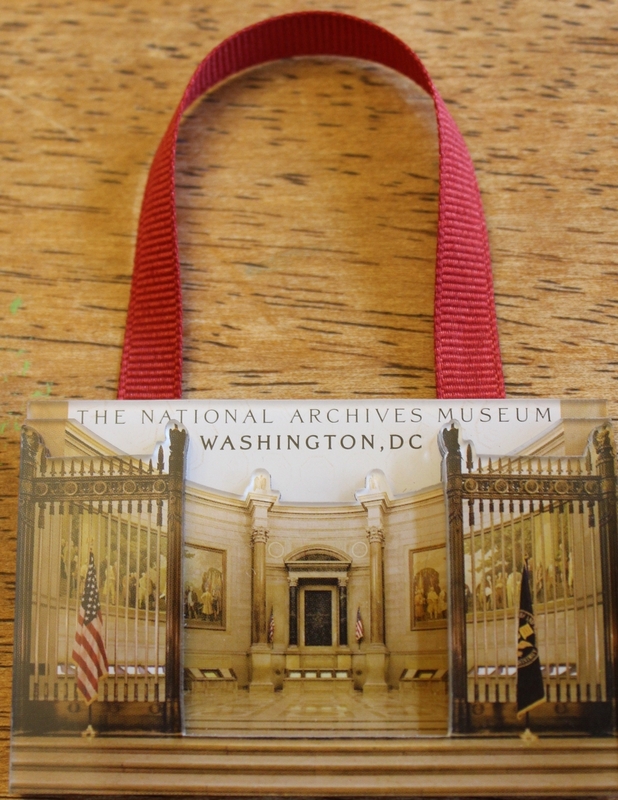 I had been wanting to go to the National Archives for a long while. Every time that we would read in history about one of our nation's important documents, I was reminded about this one place that the kids had not yet seen. The road trip this year changed that and with our stop at the National Archives the kids were able to see them all. After seeing the National Archives, that night we went back to the hotel and watched National Treasure where they broke into the Archives and stole the Declaration of Independence. It was such a fun day in D.C and here is the blog and pictures from that day. This was a big day for my little two-Christmas parties at school. Keaton could not put on her pajamas fast enough this morning. Yes, it was pajama day and thankfully, Whitman never batted an eye about wearing his pajamas. I am not too sure if he would have liked that idea but since he had never worn those pjs yet, he didn't yet know that they were pajamas and not actually school clothes. Robby took them on to school after they grabbed their breakfast while I started school with the others. We were able to finish most everything before I had to jump in the car to head to the school Christmas parties. When Robby left to take the kids this morning I told him that I would bring the teacher's Christmas gifts but I was in such a hurry to leave that I left them at home-argh! Keaton and Whitman must have partied all morning long-they had already seen Santa, heard the book The Polar Express and drank hot chocolate (though mine didn't drink any.) The first activity for both classes was eating cupcakes. Then Whitman's class had a few games and even decorated ice cream cone Christmas trees. Keaton's class also played some games and then both classes began passing out their goodie bags. When the party was over, Keaton picked up Whitman's Christmas tree and we headed to the car. I had asked her repeatedly if she could carry it and she assured me that she could. As we were about to step outside, she dropped it. I quickly picked it up and put it back in the plate. Whitman said "it is ruined" to which I replied that it was just fine and now we could eat it in the car. Keaton then picked that tree back up again (my hands were full of coats, bags, gifts and artwork) and immediately dropped it again. This time Keaton said, "well, now it is ruined." It was pretty much smashed to pieces but Whitman didn't really care and the rest of us munched on it for the rest of the day. While I was gone, the kids finished up school and did a few chores. I came home and soon we were eating our leftovers for lunch. Afterwards, I helped the kids finish chores and soon we were all loaded up headed to the dentist-everyone except for Whitman and Robby. Taking my crew to the dentist is always an exciting event. We certainly do liven up the place. There were no cavities and just as I was about to begin celebrating, he handed me a card of an orthodontist. It looks like it is time for Reagan to possibly get braces. He said that he will do braces but since this would involve jaw work he wouldn't do it-when her molars touch, then her front teeth do not touch. Oh, well I can't say that we are surprised by having a Dennie that needs braces-it was eventually going to happen. Afterwards, I lost my mind and took the kids to the Dollar Store. They had to buy one gift for our homeschool gift swap but ended up buying gifts for each other. I had kids running all over that store. It was craziness-when we did get home, I made each person pay me because before they could receive the bag of what they had bought. We did pick up pizza on the way home and ate it. Keaton noticed the beautiful sky outside and asked me to take her picture and then goodness gracious, I only took blurry pictures. Before long, I was back in the car taking the boys to basketball practice. Campbell tagged alone and I was able to visit with Sara for a bit during practice. Back at home, Keaton and Reagan spent most of their time wrapping presents that they had bought today. When we came back home, the kids had showers and ate some of their cake before heading to bed. We had some ice cream with Shannon before I went outside to sand and then to work on the blog for a little bit. One more day of school before Christmas break and I am probably more excited than the kids! December 13, 2016-Happy Birthday Anderson!